Instant Download! 2 files in for the price of 1! 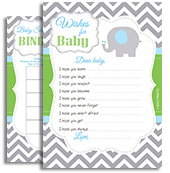 Wrap your Baby Shower Chocolate Bar and Nuggets giveaways into a cute Grey Elephant Chocolate Bar and Nugget Wrapper. Suitable for a Hershey Standard Chocolate Bar and Hershey Nuggets size candies. ✔ You will get 2 .PDFs – one will have 2 standard chocolate/candy bar wrapper – 2 per page; each wrapper is approximately 5,27" wide x 5,3" high. Fit to 1.55oz Chocolate Bars. Other file with nuggets wrappers will have 18 wrappers per page; each wrapper is 3” high x 1.5” wide. ⓟPERSONALIZATION: These Grey Elephant Candy Wrappers can be personalized with NAME, date and you can have a custom text on the sides for an extra charge - please contact us prior to the order for a quote/price. ✄Candy Wrappers/Labels, ideally, are designed to be printed on a regular paper. You can use a sticker paper for nuggets wrappers – it is up to you. IMPORTANT: this file is not designed to fit any “pre-cut” template. © ADLY PRINTS, 2010-2015. All right reserved. Unauthorized use and/or duplication of these images and materials without express and written permission from ADLY PRINTS authors and owners is strictly prohibited. Excerpts and links may be used, provided that full and clear credit is given to ADLY PRINTS – INVITATIONS AND PARTY DESIGNS, with appropriate and specific direction to the original content.